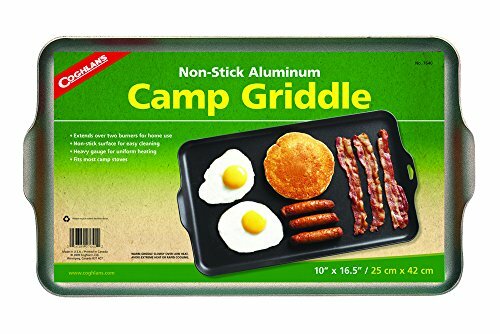 Made of heavy gauge aluminum and featuring a nonstick surface for easy clean-up the Coghlan's Camp Griddle extends over two burners on most camp stoves and home stoves, providing enough room for cooking a full course breakfast or dinner. Measuring 16-1/2 x 10 inches, it features an integrated hook for hanging to dry or storing. Coghlan's makes the outdoors more comfortable and enjoyable with over 450 accessories for camping, hiking, fishing, and RVing -- from cooking gear to first aid kits, insect netting, firestarters, tent repair, and more.